The Ma'amSir Phenomenon - It seems that where ever we go, Colin & I are now addressed collectively. We are now one being, known to all customer service workers in malls, hotels, restaurants, etc, as "Ma'amsir". It sounds more like mumser when they say it. "Hello Ma'amsir. Table for two and baby, Ma'amsir?" I quite enjoy it. And when mom was with us, we became "Hello Ma'amsirma'am" or, even funnier, "Hello Ma'amMa'amSir" (mummumser). I can't help but make faces at Colin when someone says it. Silly, I know. Racing Stripes Everywhere - I know I said I would dedicate a whole entry to the Qatari driving, and I will... soon. Today I do have to make mention of the very popular, specific 'style' of vehicle you see everywhere. 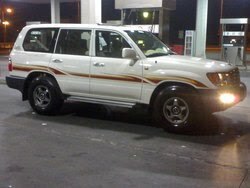 Hands down, the Toyota Land Cruiser seems to me to be the vehicle of choice on the road... but whatever it is the locals choose to drive, the majority of cars seem to have one thing in common: the whacked-out 1980's flashy gold, silver and red racing stripes. They adorn both sides of the vehicle, and stretch from headlight to bumper. I told Colin I refused to buy a bedazzled SUV for myself, but it was a difficult task to accomplish. The fancy paint jobs are everywhere! I have noticed that many of our neighbours drive them, and I hope this is a trend that doesn't catch on. Perhaps in two years, I will be longing for such a paint job on my own car. If you come for a visit while we are here, and we pick you up from the airport in such a psycadellic ride, just bite your tongue. We may just think it's stylish. Midnight Swims - As I write this, my mom is on a plane somewhere on her way back to Nova Scotia. She had a great trip, and we were on the go every single day - poor Ella! An important discovery for me though: the compound pool. Of course I have been to the pool already, but mom & I started venturing down for a swim before bed most nights... somewhere between 10pm and midnight. It turns out the pool is open 24 hours a day, so why not? Anyhow, the water at this time is a perfect temperature, there isn't a soul around, and I could think of worse ways to end a day. Someone else hurry and visit us so I can have a swimming partner while Colin and Ella snooze! Construction began in our backyard this morning. We are having our brick patio extended to accommodate a covered sitting area (the next phase of construction). I just brought the LBM some refreshments as it is hot out there anyhow, but the blue coveralls must make it just about unbearable! Anyhow, so excited for this new space. This is part of my continued effort to make our backyard a place you really want to be in. I hope we get to use it before the crazy heat arrives... fingers crossed! First - I am DEFINITELY going for midnight swims with you in approximately 15 days! Second - I am waiting with baited breath for the first ma'amma'amma'amsir we hear! mummummumsir ha!